Intricate handcrafted marionette bird seller with five strings. The Alpine man is made from wood. He is wearing a suede hat (with rope and feather), wool cloak, cotton shirt, wool pants and leather boots. He is carrying two intricate wood bird houses. This puppet is made in Germany. Tag says: "Hi! 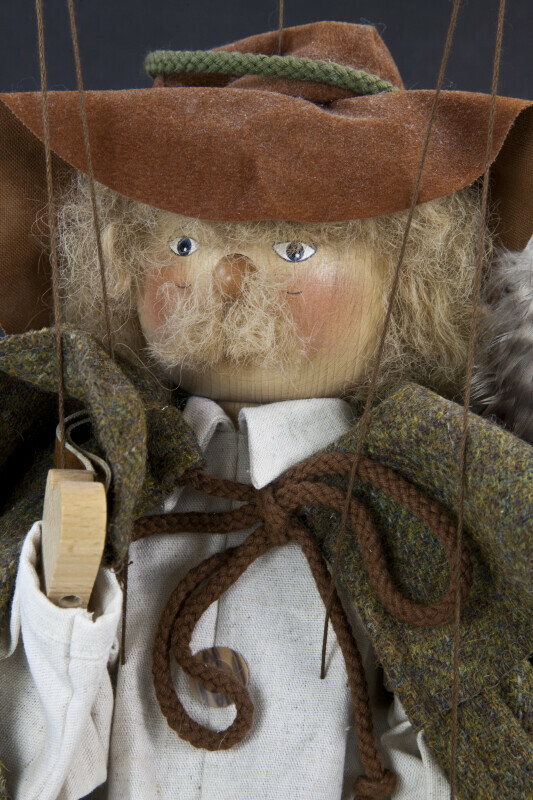 I am a hand-made wooden puppet-on-a-string from Ursula Gehlmann workshop. I have been created from wood with utmost care. My clothes have been sewn in costly detailed work with all the available love of precision. I am about 40 centimeters high and fully functioning. I am much esteemed by hobbyists and collectors, because I am an original decoration for every lodging. The original signature of my creation at the end of this certificate testifies that I am a genuine Ursula-Gehlmann puppet-on-a-string. Ursula Gehlmann." The figure stands 16 inches (40 cm) tall.